When it comes to corporate pilot resumes, it’s the little details that can reveal how much effort you did … or didn’t … put in. 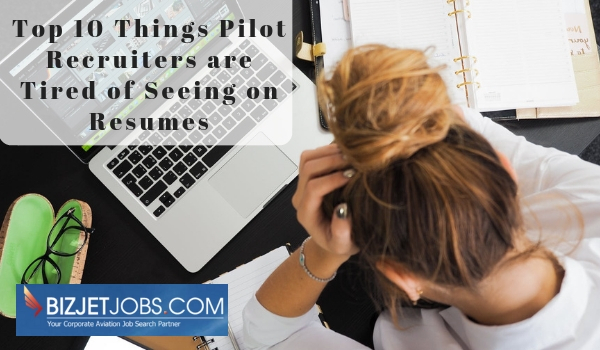 Corporate pilot recruiters review hundreds of resumes as part of their job, so it’s only natural they get tired of seeing the same mistakes, outdated formats, and overall sloppiness day in and day out. Want a better shot when you apply for your next corporate pilot job? Give recruiters’ overworked eyes a rest. One of the easiest ways to impress these hard-working professionals is to turn in an excellent resume that doesn’t make them groan. To help get you started, be aware of the resume pitfalls to avoid so you can stand out from the competition—in a good way. Want to know how to catch the eye of a seasoned recruiter? Your resume has to start off strong. A well-written Career Summary section does just that, but the typical pilot neglects any focus on this. It doesn’t have to be overly creative, but it is your elevator pitch. Short, specific sentences that show you’ve put some thought into your own skills and experience fill recruiter’s need for brevity and relevance. Which is more compelling and likely to “wake up” your recruiter from the monotony of her stack of bland pilot resumes? Especially applicable to pilots with loads of experience: when it comes to your work history, listing years instead of months and years can imply that you’re hiding something, like employment gaps. To avoid the back-and-forth, just add the actual timeline to your resume, with months and years, even if you do have employment gaps. Add an explanation for any gaps, such as a contract role. If your company was acquired and you didn’t actually change roles, make that clear. Also, be sure to always include the standard resume sections: Experience, Education, and Skills in your corporate pilot resumes. Many of our larger pilot employers use Applicant Tracking Software (ATS), computerized systems that pre-screen resumes for specific details. Research shows that nearly 75% of resumes that go through an ATS are eliminated because they don’t meet the requirements the hiring manager specified, such as the right skills, education level, or job titles. So even if you graduated from college thirty years ago, don’t skip over your Education section. Your resume might not be passed along to recruiters and hiring managers at all if you don’t include all the information the system requires. They’re pilot recruiters; they know what your job entails. Just listing your job duties or activities is outdated, because it typically doesn’t tell recruiters anything they don’t already know. Find the closest “standard” title to what you do if your company has created a unique or non-standard title for you. An ATS might take the words and phrases in your resume out of context – or pass you over if you don’t mention a standard job title they’re looking for in your work experience section. And save the creative pie charts, graphs, and icons for the in-person interview. It should be easy for a busy hiring manager to find all of the relevant information like company names, dates, job titles, and accomplishments, says Helen Godfrey, a Houston-based career coach and owner of The Authentic Path. It’s helpful to understand how the ATS robots interpret your resume so you can set the record straight. Read our previous posts on Computer-Friendly Resume Formatting and Using Contextualized Keywords on Your Pilot Resume. Once and for all: just say no to Comic Sans and other weird-looking fonts – and not just because it looks unprofessional (although that’s a great reason)! ATS robots and hiring managers prefer common fonts like Arial or Times New Roman and a simple format that’s easy to interpret. Job seekers love using terms like “collaborative” and “proven track record,” but without any associated quantitative results, these professional buzzwords are meaningless to a recruiter. As in tip 3 above, if you’re going to use these buzzwords be sure to include bullets that demonstrate them concretely. For example, say you are collaborative and mention taking the lead in implementing a new training program. For more guidance on email addresses, see our previous post Top 10 Ways to Set Up an Appealing Pilot Email Address. At BizJetJobs, pilots often ask us how they can get their prospective pilot employer to call them back. But we hear it time and time again from employers: they’re getting floods of resumes, many of them totally untailored, for every job they post. If a prospective pilot can’t take the time to read the job requirements and include how he or she fits them in their resume, why should I even take the time to let them know I received the resume at all? The bottom line: in this increasingly online interaction, it’s important for both sides to remember there’s always human being at the other end of the screen. If you think that once your pilot resume is ready you can start sending it all over town, think again. Instead of using a generic “one-size-fits-all” resume, have a few versions that are tailored to the different types of roles you are pursing. For maximum results, tweak your resume to reflect the requirements listed in each specific job post. Employers will appreciate that you cared enough about the job to customize your resume and show how you’re a perfect fit. So want to know the secret for getting past the ATS? It’s all in the job posting. Don’t copy the posting word for word, but do use some of the same terms they use in the job description in your resume. Use the job description as a map to the exact terms and qualifications your prospective employer is looking for, and include anything relevant in your resume. Years ago, word got out that a resume should be no longer than one page. In 2018, our pilot employers confirm: resumes are not getting tossed in the garbage because they have three pages. Today’s recruiters know that the resume can be as long as it needs to be to relay the value you bring to the table. In fact, if you’ve had several years of experience, it might seem odd if your resume is on the shorter side! What is most important is to make sure that your recent and most compelling information appears on the first page, and that the resume as a whole offers the a relevant snapshot of your accomplishments and qualifications. According to our pilot recruiters, spelling errors, messed up margins, odd spacing, inconsistent font sizing and general sloppiness say a lot about you as an employee. For the love of flying and all that’s holy, get a second pair of eyes – a trusted colleague, your nephew, your spouse – to review your work. Looking for pilot cover letter examples, pilot resume templates, sample pilot resumes, resume examples or formatting advice? We’ve got ’em! Download the BizJetJobs.com International Pilot Resume Example. This entry was posted in Aviation Staffing, Career Advancement, resume writing, Salary by Amanda Jenkins. Bookmark the permalink.